Labor Commissioner Robert Winglass (left) chats with John Costin, owner of Veneer Services Unlimited of Kennebunk, about how Maine can grow jobs at a forum hosted by Gov. Paul LePage at Southern Maine Community College in South Portland on Oct. 19, 2011. SOUTH PORTLAND, Maine — Patrick Shrader of Arundel Machine Tool wanted to let state government know that his company’s 2012 health care bills for family plans jumped 16 percent, and that hurts his business. Jeanne Johnson, co-owner of Breakwater Vineyards in Owls Head, looked to talk to officials about better marketing the 23 wineries in Maine to tourists, getting them to stay in the state on longer vacations. Daniel Meyaard, corporate vice president for worldwide operations at IDEXX, hoped to chat with someone from the state about making sure that the colleges and universities were turning out students with the right skill sets so his company could continue to grow. On Wednesday, they were all in the right place. Gov. Paul LePage held his first of three jobs workshops at Southern Maine Community College with about 150 businesspeople invited to attend. Two more workshops are planned for Bangor and Auburn on Oct. 26 and Nov. 17. “It’s time to get to real work, to find out what hinders us from creating jobs and what we can do in Augusta to help,” said LePage at the opening of the workshop. 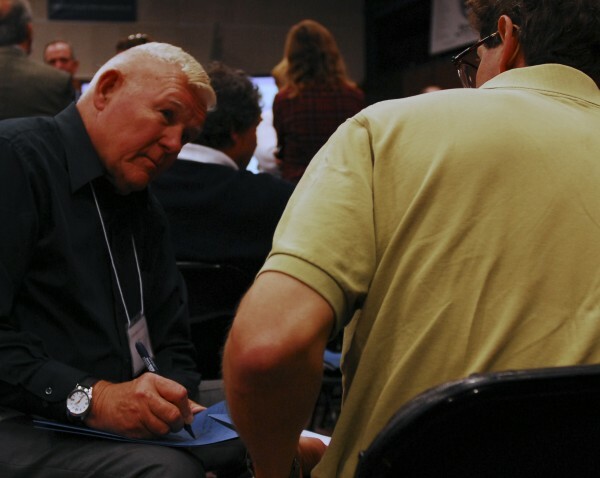 Businesspeople spoke with LePage about their problems and thoughts on job creation in a breakout session that was closed to the media. At the same time, Deb Neumann of the Department of Economic and Community Development spoke to another group about what the state was doing to be more business-friendly and to solicit thoughts from businesspeople about what else to work on. And a third group was in the SMCC gym in an informal networking environment with a number of top state officials including Education Commissioner Stephen Bowen, Department of Environmental Protection Commissioner Patricia Aho, Labor Commissioner Robert Winglass, Department of Economic and Community Development Commissioner George Gervais, Ken Fletcher, director of the Governor’s Office of Energy Independence, and others. John Costin of Veneer Services Unlimited of Kennebunk sat in deep conversation with Winglass for some time. His 10-year-old company produces custom components for the architectural woodworking and furniture sectors. Winglass asked Costin what his company needs to create jobs, said Costin. That boils down to demand and capital, he said. While local banks still are lending money to businesses, credit from the large banks remains tight, he said. Because working capital is tight across the business networks, cash flow is a problem. All of Costin’s vendors demand cash on delivery and no longer extend credit, he said. “It makes it a very difficult environment to do business in,” he said. Costin said he planned to propose to the governor that Maine establish a state bank like the one in North Dakota. Such a bank could help small businesses while also increasing state revenue, Costin said. Rep. Dianne Russell, D-Portland, proposed creating such a bank in the last session but the bill wasn’t adopted. Shrader, of Arundel Machine Tool, spoke to several of the state officials. His company recently expanded, adding 10,000 square feet to its 30,000-square-foot building. A skilled work force was a concern for Shrader as well. To manage, Arundel Machine Tool works with Sanford Vocational School and SMCC to develop machinists. It also has an in-house mentoring program that allows students to work in the trade. Shrader said he’d like to see the state have a jobs strategy — an articulated plan for keeping companies here and happy and for attracting and growing new companies. Labor Commissioner Winglass said people were telling him about their concerns with competing businesses paying employees under the table. There’s a number of related areas his department is looking into, Winglass said, from Maine residents working in New Hampshire and not declaring the income to cases of forgery. His department is working with the Department of Public Safety and plans a new effort to address the problems. Economic Development Commissioner Gervais said many of the businesspeople talking with him about training needs and other issues aren’t aware of programs the state already offers that could help them. One such is the Maine Quality Center program which provides companies with targeted, customizable training programs for their work force. “What I’m learning is communicating about what we have to offer and what we’re doing is where it’s at,” he said. The Department of Economic and Community Development’s plans to have a team of “account executives” working in the state, interacting with businesses, should help that effort, he said. One of those executives, Deb Neumann, was talking with other businesspeople about changes the LePage administration has made. For example, each state department now has a business liaison. If a businessperson needs information or help from a department, it’s that person’s job to assist. He suggested that the state think strategically about what sorts of business it wants to attract. Then, said Eng, coordinate efforts among all state agencies, among all business assistance programs, to get those companies here. The participants also heard from one business with big expansion plans — Pratt & Whitney, which has a 1,329-person division in North Berwick making jet engine components. Leo Dionne of Pratt said the division plans to hire 500 new employees over the next five years to handle new lines. The company has invested about $10 million in capital projects in North Berwick this year, he said, with $15 million to $18 million planned next year and $20 million a year for the next few years after. The division has been successful, he said, because it has focused on making a number of components in jet engines, not just one. And, he said, the company has embraced a lean manufacturing mentality for all parts of the operation, from shipping to engineering to production. In wrapping up the day, LePage said he understands more and more that the state needs to focus its efforts on K-12 education. “It’s not about money, it’s about effectiveness,” he said. Businesspeople also stressed to him that broadband Internet needs to be rolled out across the state, faster than it is now. And, he said, he heard that some state legislators aren’t being responsive to business concerns. He urged those in the crowd to call his office, regardless of the legislator’s party, if phone calls were being ignored.